1. Preheat the oven to 200ºC, gas mark 6. Season the flour, and use it to dust the lamb. Heat half the oil in a large frying pan, and brown the lamb all over. Remove from the pan after browning and place in a large roasting tin. Add the remaining oil to the pan, and cook the onions for a few minutes, then add the garlic and rosemary, and cook for a minute. Tip in any remaining flour and cook for just a minute. 2. Add the sugar and tomato purée, and cook for a minute more, then pour in the ale and stock, and bring to a simmer. Pour over the lamb, and place in the oven for about 2½ hours, turning the leg over a couple of times during cooking, covering with foil if it gets too dark, until the meat falls apart and the sauce is rich and thickened. 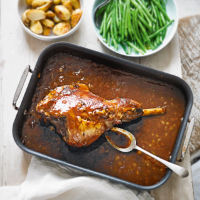 Serve the lamb and sauce with roasted new potatoes, minted peas and green beans.